Our custom floor return grilles are made from a heavy gauge steel so that they can be used to support weight when used on the floor. The metal returns are available in 195 different sizes (listed in the table below in inches) perfect to use on wall, ceiling, or floor. The variety of sizes ensure that you can find the size you need. 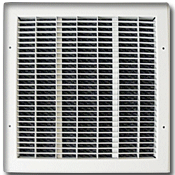 These custom floor return grilles have a honeycomb design and are available in a white or tan color. Order the metal return with screw holes if you are looking to install them into the wall or ceiling. These custom floor return grilles feature a traditional slotted design on the faceplate. The fins/slots will run parallel with the longest dimension in the size. The metal returns are made with a welded core and can be used in high traffic areas. Order your custom floor or wall grilles by measuring your hole opening. These metal returns are considered a special ordered item, so call us with any questions before placing an order. Orders cannot be cancelled once placed. Also available are metal plated options. Call for details. Tip: When ordering metal returns make sure to get the measurement of your hole opening in the wall, ceiling, or floor. The 30 inch x 60 inch custom floor return grille will fit into a hole opening of that size. The faceplate will have an additional 2 and 7/16 inches larger for installation purposes. Important: These metal returns are considered custom orders that are non returnable and cannot be canceled once payment is received. Lead time for the custom floor return grilles is 4 to 6 weeks to be made and shipped. Check out this style of custom floor return grille in 7 decorative designer finishes. If you need an oversized floor register (with a damper control) please see our custom metal floor registers. We also offer a more industrial look in heavy duty floor registers or you can find them as heavy gauge return air grilles no damper. Call today about these custom floor return grilles to answer any questions you may have about this wonderful product!